The liver is a large organ that is essential for the normal functioning of the body. This organ produces the substances that digest fats and carbohydrates, and helps to clear the body from toxins. When a man has severe problems with the liver, there are several definite signs. Liver problems are diagnosed based on the nature of these signs, as well as the results of blood tests. One of the principle symptoms of liver problems is jaundice, according to the University of Maryland Medical Center. 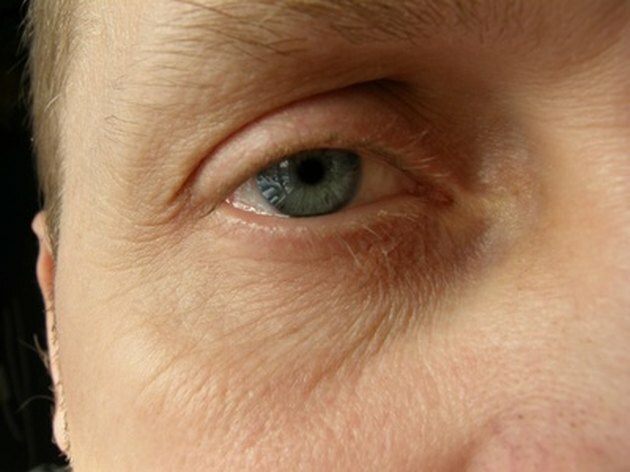 Jaundice causes the skin and the whites of the eyes to become yellow and discolored. The yellow color is due to high levels of a molecule called bilirubin, which is normally broken down by the liver. In addition to yellow skin and eyes, bilirubin also causes the urine to turn an abnormally dark color. Not only is jaundice the principle sign of liver problems, but it is often the first and occasionally, the only sign of liver problems. Problems with the liver often cause this organ to become larger than usual, according to the Merck Manual of Medical Information. This may cause the upper right quadrant of the abdomen to become somewhat distended. Also contributing to a swollen and tender abdomen is the accumulation of a fluid, called ascites, in the abdomen. Problems with the liver can also cause an imbalance of hormones in the body. Specifically, Merck Manuals notes that even though the liver continues to produce insulin, insulin resistance occurs, which is the inability of cells to properly use the insulin, the hormone that moves glucose from the bloodstream into the cells. Insulin resistance is also linked to erectile dysfunction. Additionally, increases in the production of estrogens from liver disease can cause male feminization, including the growth of breasts, clinically called gynecomastia. Problems with the liver can cause a man's stool to be abnormally pale. The pale color of stool is related to problems with the production of bile, which is produced by the liver. Alternatively, the stool may be abnormally dark, almost black in color, which is caused by the mixing of blood with stool. If enough blood is present in the stool, the redness of the blood may also be seen in addition to dark stool.